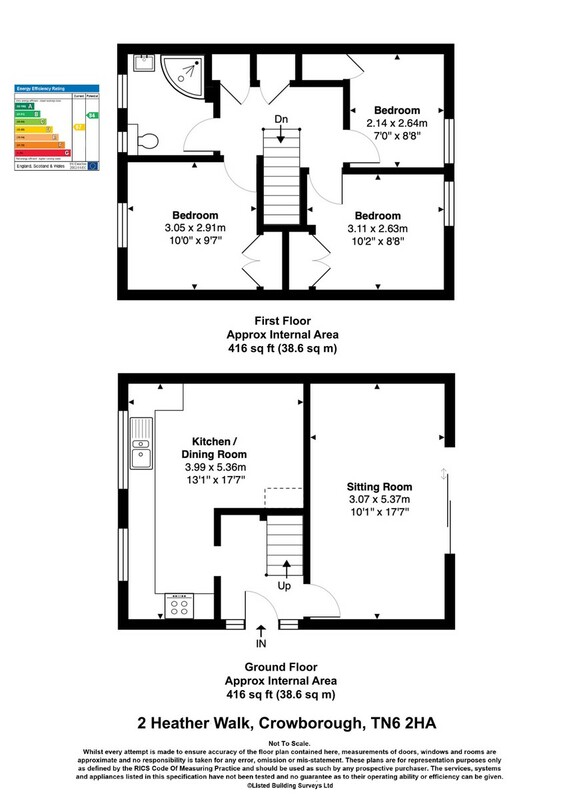 LIVING ROOM: Wall mounted electric feature fireplace (not tested), two wall lights, tv point, corner coving, laminate flooring, radiator, double glazed sliding patio doors to rear garden. KITCHEN/DINER: Range of matching wall and base units with roll top worksurfaces and stone effect tiled splashback, integrated electric oven with 4-ring electric hob, spaces for freestanding washing machine, dishwasher and fridge/freezer, one and half stainless steel sink bowl and drainer with chrome mixer tap, wall mounted combi gas boiler, wooden laminate flooring, space for dining table and chairs, radiator, high level mounted fuse box, two double glazed windows to front. BEDROOM: Fitted double wardrobe, newly fitted carpet, radiator, telephone point, double glazed window to front. BEDROOM: Fitted double wardrobe, newly fitted carpet, radiator, double glazed window to rear. BEDROOM: Single fitted cupboard, radiator, double glazed window to rear. FAMILY SHOWER ROOM: Corner shower cubicle with sliding curved glass doors, overhead shower and separate shower attachments with jets, floating wash hand basin with chrome mixer tap, low level wc, part tiled walling, recessed spot light, vinyl flooring, chrome ladder style heated towel rail, floor to ceiling fitted cupboard, extractor fan, two obscure double glazed windows to front. OUTSIDE: To the front the property is approached via a quiet footpath with a timber gate leading to the enclosed front garden with area laid to lawn, various flower borders and shrubs, outside tap, further area to side laid to bark chippings enclosed by hedging and low level fencing. To the side of the property is a patio area and space for a garden shed which in turn leads to the rear garden with a further paved patio area ideal for outside entertaining, expanse of lawn, large timber built garden shed/office with light and power connected, wooden laminate flooring and separate fuse box with all being enclosed by fence and hedge boundaries.